Effectiveness over time: Ensure the methods chosen actually reduce the amount of total emissions over time, not just delay them. Emissions transport: Some ERTs can also reduce plume rise and could increase surface smoke concentrations. Documentation: It is recommended that documentation be kept on the use of ERTs and emissions averted if needed. Fire personnel exposure: If mop-up is considered as an ERT, be aware of the potential smoke impacts to fire personnel carrying out the mop-up operations. Are the risks associated with smoke being eliminated, or just transferred from the public to the fire personnel? Fuel loading can be reduced either mechanically, or by grazing. Mechanical treatment can include onsite chipping of debris, firewood collection, thinning, piling, mastication, mechanical removal of logging debris, or whole tree harvesting. Sometimes these fuel reduction techniques may be effective enough to eliminate the immediate need for prescribed burning. Grazing is another option for reducing fuel loading. Grazing may be economical, however animals are selective in what they eat, and may cause changes in the plant community over time. Grazing on steep slopes may also cause erosion. Reducing the quantities of fuel burned in another method of reducing emissions. This can be accomplished by burning in high moisture conditions, implementing mop up quickly after a burn, or by burning before new fuels emerge. Reducing the quantity of fuel consumed by fire may be achieved by burning in high moisture conditions when less fuel will be consumed than in dry conditions. Generally, conditions that facilitate this strategy occur a few days after a soaking rain, or following snowmelt. 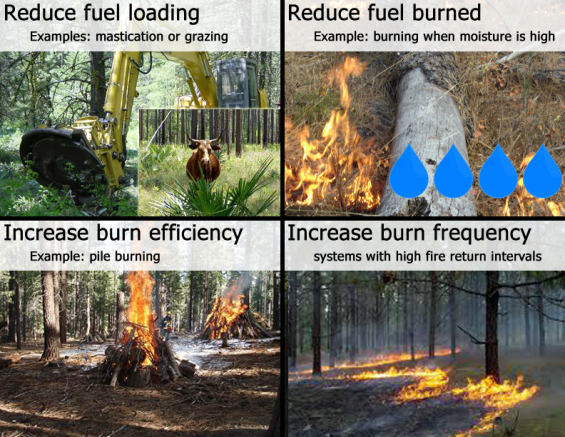 Burning in high moisture conditions creates the possibility of longer smoldering times and increased emissions if burning material does not extinguish soon after the burn. Rapid mop up is another strategy to reduce the amount of fuels consumed by not allowing them to smolder for long periods of time. Burning before new fuels emerge is another method of reducing the quantity of fuel consumed, thereby reducing emissions. Pile burning, back fires, and burning in dry conditions are all methods which generate greater heat allowing the materials to be consumed by fire more completely. These methods cause more fuel to be burned in the flaming phase of combustion, creating less emissions than if the fuel were allowed to smolder. This method should be chosen with care, due to the risk that a hotter fire may burn more fuels than would have otherwise consumed, reducing its usefulness in decreasing emissions. Soil heating should also be taken into account when using this strategy. High heat for long durations of time can destroy soil organic matter and greatly alter soil structural properties, which may result in increased post-burn erosion. Burning more frequently reduces fuel accumulation, resulting is less biomass being burned. This approach of frequent low intensity burns may also prevent unwanted species from establishing. Looking for additional BSMP resources? Webinar: Basic Smoke Management Practices (Pete Lahm, US Forest Service Air Resource Specialist) Discusses the development and principles of BSMPs for prescribed burners. Ottmar R.D., Peterson J.L., Leenhouts B., and J.E. Core. Smoke Management: Techniques to Reduce or Redistribute Emissions. Chapter in: Hardy, Colin C.; Ottmar, Roger D.; Peterson, Janice L.; Core, John E.; Seamon, Paula. 2001. Smoke management guide for prescribed and wildland fire, 2001 edition. PMS 420-2. National Wildfire Coordination Group, National Interagency Fire Center. Boise, Idaho. 226 pp. Whalen, et al. 2003. Smoke Management Techniques RX-410. A publication of the National Wildfire Coordinating Group.